We’d love your help. Let us know what’s wrong with this preview of Real Magic by Isaac Bonewits. Examines every category of occult phenomena from ESP to Eastern ritual and explores the basic laws of magic, relating them to the natural laws of the universe. To ask other readers questions about Real Magic, please sign up. In honor of the man we lost today, I think it's time to re-read this classic. This is a book that requires several readings. After one reading, I'm not sure I understand everything that Isaac was laying out, but I found it a challenging and engaging read that requires much note-taking. This is also more of a thesis on the concept of "magic" and requires a lot of thought. Not for those looking for fluff and airy-fairy concepts. This appears to be a scholastic work by a person whose veracity I respect. this book provides a thorough scientific overview of psychic phenomenon and the occult. this includes everything from telepathy to clairvoyance to esp and lots more. apparently the russians are way ahead of the west and others in psychic technologies, according to this book. and not only are they very active in research, but they have also found ways to apply it for military and espionage purposes. i have done a lot of reading on the occult. there's an awful lot of crap out there, but this book this book provides a thorough scientific overview of psychic phenomenon and the occult. this includes everything from telepathy to clairvoyance to esp and lots more. apparently the russians are way ahead of the west and others in psychic technologies, according to this book. and not only are they very active in research, but they have also found ways to apply it for military and espionage purposes. I enjoyed the concept of the switchboard and the bibliography is worth it in itself, but overall I thought the book felt super dated and didn't have a lot of information I could use in any way. Very informative. Really enjoyed reading it. Not real useful in real life. Read think and grow rich by Napoelon Hill for the real secrets of real magic and to get all your grandest dreams! Confirmed some ideas I've had , but couldn't name. Still relevant after all these years. Not what I expected at all. In a good way. Isaac Bonewits is thoroughly likable, with his dry and sardonic sense of humor and his compelling intelligence. He takes his subject seriously, however, and shares his wisdom with a direct, no-nonsense attitude in his prose. He explores the techniques, theories, and reasoning of working magic. By the end of the book, one is itching to put his ideas into practice. 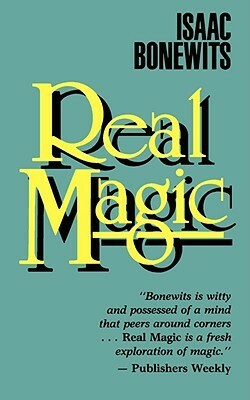 For one who has dabbled, or wants to have dabbled, in the practice of magic, this book will be a hard kick in the pants and a powerful Isaac Bonewits is thoroughly likable, with his dry and sardonic sense of humor and his compelling intelligence. He takes his subject seriously, however, and shares his wisdom with a direct, no-nonsense attitude in his prose. He explores the techniques, theories, and reasoning of working magic. By the end of the book, one is itching to put his ideas into practice. For one who has dabbled, or wants to have dabbled, in the practice of magic, this book will be a hard kick in the pants and a powerful urge forward. There is no doubts or maybes expressed in these pages, only the firm conviction that magic is a reality on the psychic level, and it has incredible power to make change in the physical. The connection between symbol, ritual, intention, and psychic power creates real results that cannot be denied, he says. The skeptic would put the book down quickly as nonsense and fantasy, perhaps laughing out loud at the claims Bonewits makes. One is quickly convinced though, no matter one's response, that Bonewits means what he says, and that the author has truly experienced the efficacy of his practice, whether by intention or by accident. I was, at least. I admit, I do have an open mind to such things. I was convinced, and I still am, although I have been but a dabbler myself. There is an "anything goes, as long as it really works" attitude that is very appealing and convincing. One important point he makes is that one has to have strong intention and strong faith that what one is doing is truly "real." There is little room for doubt; one must be firm and convinced that what he's doing will work. I guess that's the real hurdle, but this book lowers it and increases one's conviction that he can clear it. A look at the occult sciences for people in the 21st century. I found that the author did a great job at conveying the ideas and procedures found within the occult so they would be more accessible to the general population. The author wrote well and the concepts outlined in Real Magic are easily understood and digested. If you are new to the occult or magic, this book offers great insights into a majority of the different studies and ideas contained within the arts. Likewise, if you have some expe A look at the occult sciences for people in the 21st century. If you are new to the occult or magic, this book offers great insights into a majority of the different studies and ideas contained within the arts. Likewise, if you have some experience in the Craft or Occult, the book offers the author's insights into the mechanics of the systems we use and, perhaps, an explanation of what those mechanics actually are. There's something for everyone. I thought this book was a great starting place for... well, "real magic." The basic definitions are super helpful, Bonewits' switchboard theory is interesting, and the bibliography is a treasure trove. Coming from a kundalini yoga background and traditional Catholic upbringing, I do wish that he'd explored mantras and mundras a bit more--especially in those two contexts. However, the absence of information in this book just inspires me to seek out additional research and/or run my own experiment I thought this book was a great starting place for... well, "real magic." The basic definitions are super helpful, Bonewits' switchboard theory is interesting, and the bibliography is a treasure trove. I should have made a comment earlier back in 2011. But I do have plans to read this again. Next time, I'll do a better review. If I were to do a class on Introduction to Magic or on Magic Theory, this would be one of the books I would choose to assign as suggested reading, if not the only one. Although Bonewits was sarcastic, he was a great magical scholar and researcher. He later turned Modern Druid, but it doesn't take away from his work. This is his first book. Practical, organized, simple, and amusing, Bonewits' book is a tome which will tickle even skeptics. The principles and methods of magic are drawn from his comparative study of world traditions and are supplemented by his own theory of how it all works. I found myself laughing almost every page, and the clear, everyday language made reading a breeze. At the root of the book, what the author is trying to get across is so great, and so simply well-said. He is funny, which lightened the book up, since it is heavy in references and examples, which may be beneficial for those who need convincing, but as one who does not, it dragged some. Read this quite a while back, but I found it very entertaining and informative. His way of thinking about magic and energy appeals to me a great deal, as it strokes the scientific side of my nature and makes it easier for me to get into the magical mindset. That said, it was dry sometimes, and people who have a dogmatic view of religion or magic probably won't like it. A seminal book for me, along with Huson's "Mastering Witchcraft." Isaac was a friend and mentor, so perhaps my thoughts are blunted by those prejudices. The notion that magic was not just black and white plus all that entailed forged my alignment with polytheistic thought. And the idea that there were other Neopagans "out there" beyond Wicca was liberating and so satisfying. There's a lot of interesting information in here from parapsychological research and spiritual comparative study , but the book feels dated and the tone is smarmy. Bonewits draws interesting connections, but I think his self proclaimed status as the only magician with a masters gets in his own way with all the pseudo academic jargon. Wonderful overview of magic and the witches who practice it. No rabbits in hats here, this is about casting spells. The author makes clear the differences between white and black magic, discusses the physics behind poltergeist activity and covers a lot of other ground. He also reproduces his diploma from Berkley on the back jacket, showing that Ronald Reagan signed off on his degree in magic. I need to re-read this. It appeals to my view of the universe, though I make no claims about the efficacy of the practices. Bonewits has plenty of ego, but his approach to life and magic is refreshingly free of woo and frippery. I first read it when I was seriously studying ways of seeing the universe, and it sits on my religion bookshelf. An absolute essential read for anyone that is honestly interested in Wicca, Magic, Neopaganism, or whatever else it goes by. It is the most scientific book I've ever read about Magic. Spotlight on some of the ridiculous things and some of the magnificent things you may find on the path. I loved this book the first time I read it and I still do. I'm also using many of Bonewits's theories for my own fantasy novel. I wish more follow up research had been done, building on his work. A classic and rigthfully so. Hey, guess what, magic is logical. This book is rather sad. In trying to convince himself that magic really works, the author has created a unfalsifiable argument. Exploration and scientific explanation on magic theory. Like life magic is not black and white but a multitude of colors. Phillip Emmons Isaac Bonewits was an influential Neopagan leader and author. He was a liturgist, speaker, journalist, Neo-druid priest, and a singer, songwriter, and independent recording artist. He had been heavily involved in occultism since the 1960s.